The delightful Kelly James from Design Ties is recuperating from knee surgery this weekend. She loved the illusions from Richard Wiseman I ran the other day and asked for more. Kelly's favorite color is purple and she needs some distraction right now, so these are for Kelly specifically. However, anybody can join in on the vertigo-inducing fun. First up, a "moving" static image. 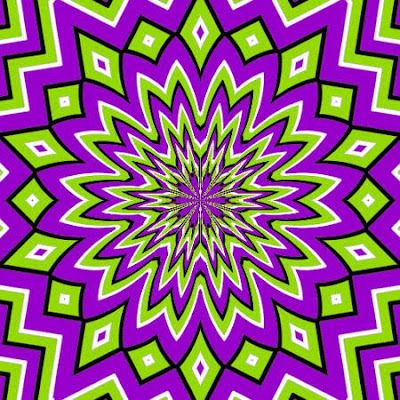 Stare at this for a sec and then try to get it to stop moving. Second up is another twist on fooling your brain. The warped lines in this illustration are pretty plain to see. Or are they? Hold a straight edge up to your monitor and you'll see that there's not a bend to be had. Pretty cool! Thanks again to the great and powerful Richard Wiseman and good wishes to Kelly. 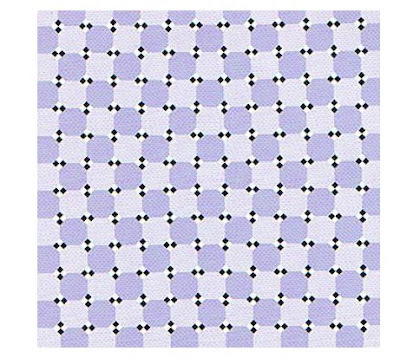 The first illusion is REALLY freaky!! It actually moves more for me when I'm not looking at it directly. My knee is doing surprisingly well -- haven't needed to take any pain meds, and I'm walking around and doing the prescribed exercises. I picked up a can of Balanced Beige today for the kitchen -- no turning back now!! Glad to hear you're on the mend Kelly, and yes that first one's a real stunner. It's really freaky and I can't get it stop jumping around once I focus on it. A room-sized version of that image would render me unable to walk or stand. You bought paint? We must be nearing the reveal of your new kitchen. Did you get the counters installed yet? Counters are theoretically arriving any day now -- it's been almost 4 weeks since the templating was done, and they said the countertops would be ready in 3-4 weeks after that. The old backsplash is gone and the walls re-drywalled and patched where necessary. We want to get two of the walls painted before we put the cabinets back up that we took down to remove the backsplash, and we want to put the cabinets back up before the countertops go in. It's an evil cycle!! I still need to send you a picture of the pendant lighting. Did I mention that I'm tired of living in a disaster zone?! Awwww, you know what? Once it's over and finished you'll look around and say to yourself "this wasn't so bad." Mark my words. That first one really freaks me out. I almost get motion sick! You're not alone. Wiseman calls the image "seasickness." It does a real number on me too, I can't look at it for too long but I keep being drawn back to it. It's an odd thing. Hi Paul, Great blog you have here. Thanks so much for baking my cake! Let me know how it turns out. Thanks for visiting. Cool post! Hey there, thanks for coming by!